This is a help page for the PELCRA Learner English Corpus online tools. An up-to-date overview of the corpus contents is available on the Browse data => Summary page. The current number of text, sentence and word segments units in the written and spoken segments of the corpus can be found in a dynamically generated table available on that page. The corpus text browser tool is available from the Browse data => Texts menu. Every text included in the PLEC corpus is listed in the browser together with some of its bibliographic annotation. A more detailed view of a text's metadata can be displayed by clicking on its title in the list. 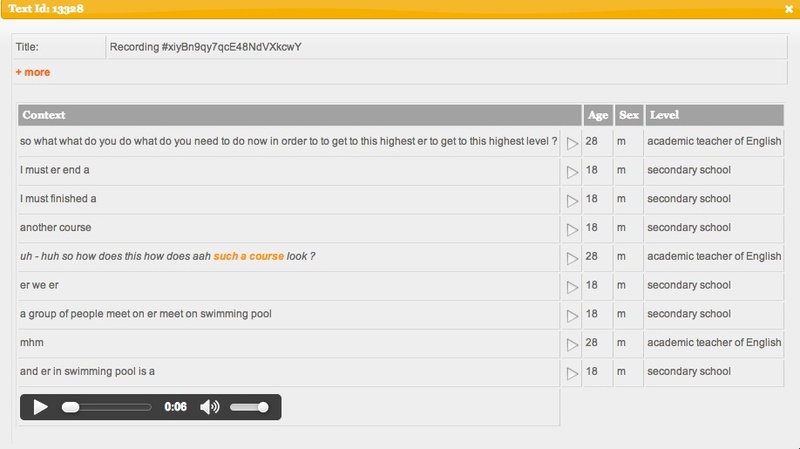 The annotation of levels was added manually after inspecting samples of each text or transcription. The PLEC corpus search engine (available from the Search menu) is an advanced search tool which can be used to run linguistic queries against the data collected in the project. To find exact matches of a word or phrase, simply type it in the search box as in this example query for the occurrences of the word area. results in concordances containing phrases such as in a city in the city and in the cities (and theoretically also in a* cities). c) This procedure is equivalent to	looking up words in the dictionary. Thus, the slop factor of n means that up to n words can occur between the query terms. a) You had promised qualificated , nice and energetic people who were not only teach us Chinese but also show us a little China . returns concordances containing occurrences of the phrase big city but not big cities. will match both history and historical. The PLEC corpus has been part-of-speech tagged with the Stanford POS tagger. This makes it possible to search the corpus using morphological criteria. There are currently two types of POS-queries supported by the search engine. Users can specify a part of speech category for a lemma by prefixing it with >l_ and appending the appropriate tag introduced by another underscore. It is possible to use wildcards to expand POS tag queries. only matches instances of tests as plural nouns. A larger context of a matched concordance can be show by clicking on the plus and speaker icons in the right-hand side of the concordance. Spoken context windows offer the additional functionality of playing out the original recording for a matched transcription snippet by clicking on the Play icon next to each utterance. When you run a query matching some result, a set of categories retrieved for those results is displayed just under the search form. We call those categories facets and they can be used as filters to narrow down the results of the search. By checking one or more of the category boxes you can add them as necessary conditions to the original query. The results of search engine queries can be exported as Microsoft Excel spreadsheets (also supported by LibreOffice). You can click on the floating Excel spreadhseet icon next to the current results view do download them automatically.